One of the tricks of shadowrunning in the Sioux Nation is keeping your eye on the things you can’t see. It’s not just the spirits and the unseen magical beings of the world—though that’s part of it—but the dangers underground. The poisons seeping into the earth from abandoned mines, and the vast complex that has been built underground, out of sight of the rest of the population. A spot where money flows and the sun never shines—what more could shadowrunners want? Butte is an addition to the Shadows in Focus: Sioux Nation series, detailing a new location for Shadowrun players, with character info, locations, background stats, and other game resources to bring exciting twists into your game. Dive into the unique shadows of the Sioux Nation and make sure you stay out of sight of the hidden dangers! 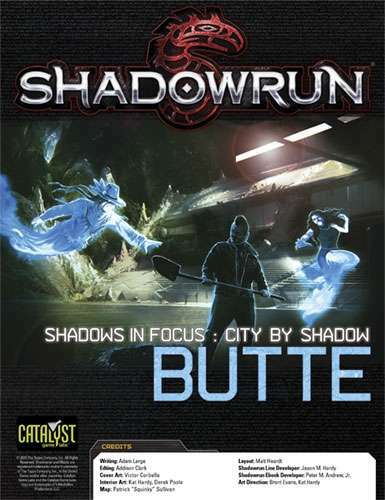 Butte can be used with the other Shadows in Focus: Sioux Nation books or all on its use, and is for use with Shadowrun, Fifth Edition.